People often associate the word “literacy” with basic skills in reading and writing that make it possible to get decent employment, make ones way through school, and function as a citizen. David Barton’s fascinating book argues that literacy is rather about connecting to the development of oral and written language and the spread of information over the past ten thousand years. To be literate is to be part of this wide world of ideas and languages. Barton locates the focus of literacy today in families, which he describes as “an ecological niche in which literacy survives, is sustained, and flourishes. In contemporary society literacy is part of the web of family life” (p. 148). Barton wants to demonstrate the “strong social basis of children’s early learning of literacy, which he calls “emergent literacy”. He argues that literacy is as much about values and attitudes associated with reading, and lovingly describes story time as typically “a warm and friendly and safe experience’..it is an intimate event where children have an adults complete attention” and we might add, their complete love. 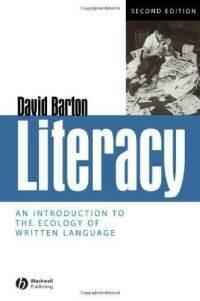 Barton argues that literacy is embedded not only in writing but in oral language and social interactions. Most surprisingly, learning to read it is not primarily about the story, but is about the interaction between parents and children and how they talk to each other during story time, what he calls the story around the story. This “talk around the text” is often “richer in variety and complexity of linguistic structure than other everyday talk” (p. 145). In this book and his earlier Local Literacy: Reading and Writing in One Community, Barton demonstrates that “…in mainstream culture, the household is structured around literacy and mediates family activities.” Whether through grocery shopping, paying bills, reading the newspaper, or tracking days on the calendar, literacy permeates the daily activities of families. Barton, D. (2007). Literacy: An introduction to the ecology of written language. (pp. 111-159).